In a concerted effort to review more of my indie products, I'm starting a new blog series on Fridays called Indies of the Week! I'll review two or three random products from my stash that didn't make it into full reviews. Things like free samples, gifts, random perfumes, etc. Hopefully, it will give me a chance to review things that I wouldn't have normally because I didn't have other things from the collection, or it just didn't make it into a review. I'm going to try to keep this to products still available for purchase, but some things might inevitably be discontinued or no longer for purchase. 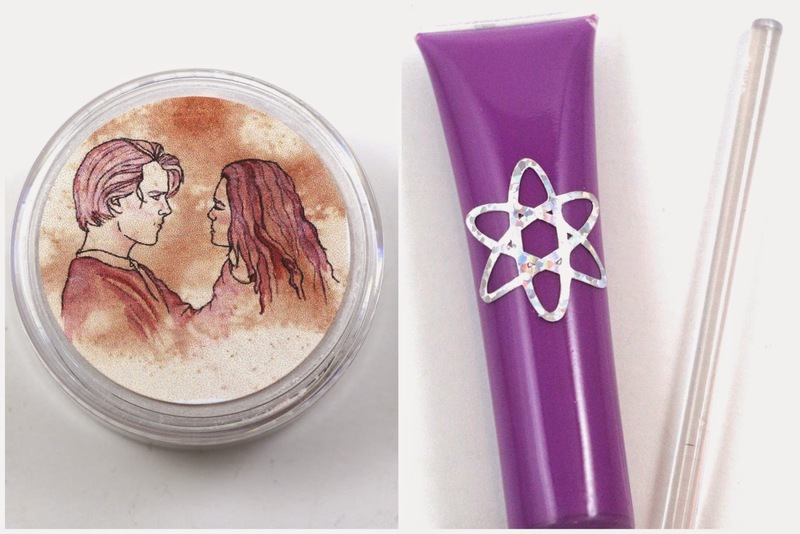 Welcome to the first of many Indies of the Week posts, let's get started with AFK Cosmetics Mawwage highlighter and Life's Entropy Crystal Violet Lip Theory! On a whim, I decided I wanted to try the AFK Cosmetics Mawwage highlighter, so I ordered a full size jar before they disappeared from the shop. This is one of the unfortunately discontinued products, and no longer available for purchase. (It's been brought back as a permanent product!) This product was from the limited Inconceivable Collection, which was inspired by The Princess Bride! Currently, the shop is closed, but reopens tomorrow. The Life's Entropy Crystal Violet Lip Theory is something I received as a gift, and have not had a chance to review on it's own. I haven't tried many of the Lip Theories either, even though they have been on my list for a while. They are frequently compared to OCC Lip Tars mostly because they can be easily mixed to make your own shades. Product Size - I ordered the full size Mawwage highlight, which comes in a 20g jar. It's usually the standard for blushes or face products in the indie world. 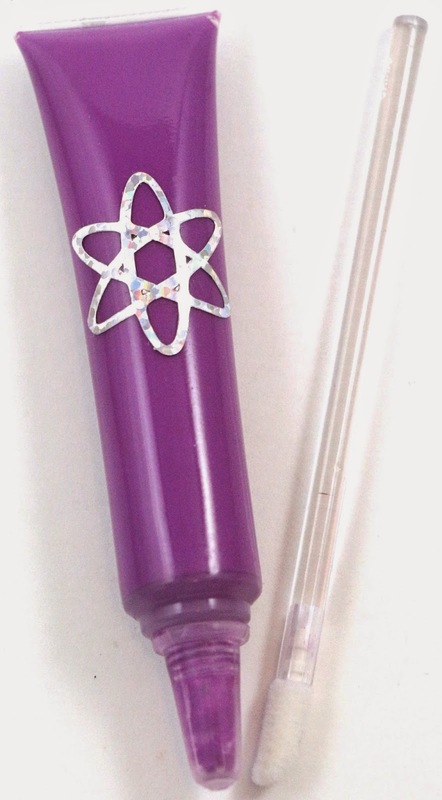 Crystal Violet is full size, but Lip Theories are also offered in sample test tube vials. 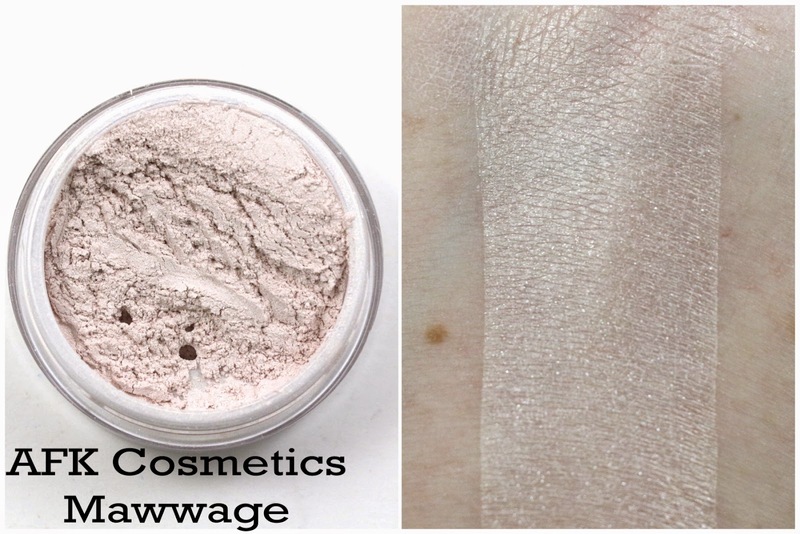 AFK Cosmetics Mawwage - "A shimmery pink based cream face highlighter." I tend to go for pink based highlight shades because I have pink undertones, but also because I like to use them for brow highlights as well. Nothing works better in my opinion with a pink/purple/red shadow look than a pink based brow highlight shadow. The texture of the highlighter itself seems more like a finishing powder, it has that light fluffy texture to it. I like the texture, it covers well, and I could see it being a good all over highlight for the summer. Or used as a blush for a subtle glow. I don't see much of the pink undertones, it looks mostly neutral to me. It doesn't seem to have as much sparkle as some of my other favorite highlighters, so I think this might work better for when you want a very subtle look. Life's Entropy Crystal Violet Lip Theory - "A cool toned medium purple." The lip theories from Life's Entropy are kind of like the indie version of OCC Lip Tars, but mostly because they can be mixed to create your own custom colors. You can even purchase the clear base and add your own lip safe eyeshadow to make a completely custom shade. In the photo, I have the full size version, which comes with a separate lip brush. I find the packaging tedious and annoying. Once you've used the brush, there's no easy way to store it without get the product all over everything. I would much rather it be packaged in an actual lip gloss tube, but I think the way it is now is so you can more easily mix your own shade. The texture reminds me of other heavily pigmented glosses, and has some staying power. I got several hours out of this shade, but it also stains. Which in my opinion is a good thing, it means the color still shows even when the glossiness has gone. This shade is just bordering on wearable and crazy, but I think might be fun in the summer for a concert, or some other event. But I definitely wouldn't be wearing it to a serious event. And I think it would look great mixed with the hot pink shade or the dark red. Availability - Mawwage has been brought back as a permanent product, and Crystal Violet is a permanent product as well. Recommendation - There are plenty of indie face highlighters, so don't be disappointed if you missed out on Mawwage. (Edit: Mawwage is no longer gone, it's been brought back as a permanent product.) I would say check out Mawwage if you have a lighter skin tone, or just want a subtle highlighted look. I would recommend checking out the Life's Entropy Lip Theories, especially since new shades were just released. What did you think of the first Indie of the Week posts? Let me know in the comments! I'm glad to see more miscellaneous reviews! Yay! I'm glad you're enjoying. Usually reviewing things gets them out of the dark depths of my stash and I actually get a chance to use and discover them. I'm hoping this will help with some of the miscellaneous items I have, that may have otherwise just disappeared.